By Guest cherryJ45, April 27, 2003 in INTRODUCE YOURSELF! I'm so sorry that you have to be here, but welcome to our family. There are alot of amazing success stories on this board from people surviving lung cancer. It's not a death sentence. The others here can help with tremendous info on dealing and living with this disease. Please post again when you know what type of L/C you have, the stage and your next steps and we will have more info for you. Keep the faith and know that there is not one single cancer out there yet that has not been survived by someone and know that you are not alone. Will be adding you to our prayers. From what little you know so far - you sound a lot like me!!! And I just turned 42 in March and have two beautiful daughters, 13 and 19 years old, and a great guy I've been dating for 1 1/2 years. I've been doing more in a weekend lately than I used to do all week before I got sick! Working in the yard, shopping, bike riding, roaming around - so don't think you'll never have any fun again. The hard part is getting past the feeling that you HAVE no future! Phooey!! Many people are cured these days (stay AWAY from the statistics on the websites!) And even those who are not "cured", can still live many years with off and on treatment. I can't stress enough the importance of learning all you can about your disease but looking towards the positive and away from all those scary numbers! NO ONES disease is 100 percent fatal..and you are young and strong!! I WAS 45, with a teen age son, when my nodule was found. And that was two years ago this past week. You are just in that very scary part. The lung cancer was my third cancer, so I went into all the testing with anti-depressents, anti-anxiety pills, and an ativan chaser. I also took PEOPLE magazine to every doctor appointment. Really! Take someone else with you to the appointments. When I met with the surgeon, I had two people in the room. Stop reading statistics. Only God knows when you will leave this earth. I am so sorry that you have come here under the circumstances but there sure are wonderful supportive survivors here who can tell you that you will be okay and although it is terrifying, you will be treated and it is not the end of the world! A 2cm tumor really is not that big and that is a blessing. Cancer is not good no matter how big your tumors are but the earlier it is caught the better! When My Moms tumors were found it was a big already over 8cms in the lung which collapsed it, and there was also a mass on her neck that was pressing on her nerves and she was in severe pain, this was in Oct of 2002, and now she is in remmission! So I hope this offers you some encouragement, there are many here with much larger tumors who are doing well. I will pray for the best possible results for your scans and please feel free to ask questions. Keep the faith and keep us posted. You hopefully may be one of the lucky ones. Most people don't have any pain and it is found at a late stage. 2 cm is puts you at T1. Look up info on staging or search for TNM. I am so glad that you have found us. I was a Stage I survivor for 18 months. I had 2 surgeries in that time, and each had excellent outcomes. Buit, for far too many of us, for me the other shoe dropped. I have been restaged to Stage IV, because of systemic lung cancer mets to my my lymphatic system. All this may sound scary to you and many others, but to me it is just another great big bump in the road that my journey with lung cancer is taking me. Through the encouragement and love and caring of all the people here at Lung Cancer Survivors for Change, I am going to beat back this latest set back. You, as well, are going to beat back what you have. Surviving is what we are all about here, and that's what we do best. We care for, we love, and we support each other here. We may cry together, but we also laugh together. The BIG comforting feeling you have right now - that's a group hug. Amazing what's good news is to me these days. My doctor called, remember I had been pipe dreaming when I said the tumor was 2cm and it was actually 5 cm? Well, now she says it's only 4cm. Yay! Then she said it doesn't appear to have spread anywhere, no lymph nodes or anything. Yay again...however there is a suspicious 1cm. nodule on my adrenal gland? So, all in all I thought it was encouraging... Labwork this morning and then finally those biopsies I was promised, no later than first of next week. I feel like it's dragging... Thanks all of you for all your help...I look in here every day, it comforts me so and everyone is so kind. I kep you all in my prayers. I am sorry you have to be here. Welcome to the board, everyone is here to support and help. I can only imagine how scary those early days must be, I remember how scared we were when my mom was first being diagnosed. Please keep us updated when you find out more. I just have to tell you all often, how grateful I am to have found this site. I look forward at the end of the day to read all the encouraging messages. You are such a wonderful bunch of people and I thank you for welcoming me. Wish me luck...my biopsy is Monday. Finally, I will know more about this ugly monster growing inside me and what to do to send it packing!! I am nervous and I know this is the easy part of all that will happen. The nurse said it should go well, occasionally air gets into the lung, then they have to put a tube into the lung to release it and then I have to stay over night. Has this happened to anyone? I had never heard of such a thing. I know I'm worrying needlessly, but it seems I quake at everything these days. I will let you know how it goes...bless you all so much. Sounds like she was informing you that sometimes they have to put in a chest tube after a biopsy because air gets in the space around the lung and that doesnt let the lung fully expand, so they put the tube to get it out. I am so glad you have decided to join this wonderful group of people. There is a wealth of knowledge here and I believe God has guided you right here. Being frightened of the unknown is normal; just don't let your mind race too far ahead. As you get more and more information from your doctor, your fears will be replaced by actions. You will need to prepare yourself for treatment - chemo, radiation, surgery, or all three. You've been reading the messages so you have seen there are quite a few success stories out there with regards to shrinking tumors, surgeries, and even remission. I had a 3 cm tumor and my left lung removed 26 years ago, and have since lead a very active life. My story was posted Feb. 28th, half way down the "Inspiration" forum, titled, "David Piercy's story of survival". This week I'm preparing for my 3rd cross country mountain bike race of the season. I had a needle biopsy (thru my back to get to the tumor). It was a piece of cake. BUT, I did have a little pneumothorax (10%). That's when there is a partial collapse of the lung. I had to stay an extra 4 hrs in the hospital while they continued to do chest xrays. They let me go with warnings of what to do if. . . Of course, I was fine. And you will be, too. I wanted to let you know that I was 44 years old with 1 son who had just graduated from High School, and a daughter who had just finished her Junior year of High School when I was diagnosed with Lung Cancer. I was erroneously put at Stage I when I was actually Stage IV. That was 3 years, 11 months, and 8 days ago. I've had a few surgeries, and was on Iressa until my tumors began to grow and spread, but the important thing is that it has been almost 4 years and I AM STILL HERE!!!! I've seen my son graduate college! I've seen my daughter graduate High School and go on to College. I've seen the white iris I planted in 1998 (called "Old Flame") bloom this year. 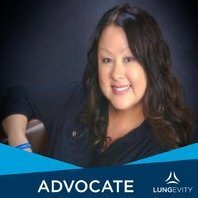 I look at having lung cancer as a chronic illness. I'll be starting another treatment soon, and hopefully it will buy me more time... until the next recurrence and the next treatment...which will hopefully by me even MORE time. So have hope. There!!! Now, if you had the patience to read as I ranted and read all of this... please let me know you're thoughts...Thanks again, all of you that have been so helpful and positive, I really enjoy being part of this board. And to Fay, I want to thank you for that message you sent me recently...I didn't see a way to respond to you and wanted too. Your message was very inspiring. I would love to talk more to you, if you would...Thanks everyone, sincerely...I will keep you posted and always keep you all in my prayers.